In The Spotlight, Inc.: Oklahoma! With stunning vocals, dance, acting, sound, costumes, scenery and an incredible orchestra, Goodspeed musical Oklahoma! is a triumph. Director Jenn Thompson creates a refreshing interpretation of the great-grand-daddy of all musicals, re-visioning the songs and scenes so many of us know by heart. This show arrives like the proverbial beautiful morning onstage, dazzling, delightful, and truly reborn. Every aspect of this production merits superlatives, but most outstanding is the sheer joy and exuberance of all the performers. Each one brings something unique and fresh to their role, bringing new zest to the experience of watching this well-known story unfold. Samantha Bruce as Laurey is a perfect example; there is a more than a touch of tomboy in her performance, adding a bold, bright edge to her ingénue. Matt Faucher gives a sultry, sensuous quality to his Jud Fry, which, combined with his powerhouse voice, makes the character very much alive. As the ever-grasping Ali Hakim, Matthew Curiano “oozes charm from every pore,” making his peddler most lovably sleazy. The orchestra, led by Music Director Michael O’Flaherty, flows and supports the singers flawlessly. The touches here, including a banjo, make it easy to fall in love with this score all over again. Kudos to this gentleman also for inspiring the incredible singers; these vocals must be heard to be believed. Lovely and authentic period costumes by Tracy Christensen move with ease and grace in the dance sequences. Scenery by Wilson Chin is a feast for the eyes, with a gorgeous sky cyclorama (beautifully lit by designer Philip Rosenberg) and clever cornrows and barn-touches everywhere. Sound Designer Jay Hilton adds his brilliance in how lovely all the voices sound, cricket song at just the right moments, and even a dog barking offstage at one point! Of special note, too: it is wonderful to watch an ensemble that creates their own background characters, adding to the richness of the scenes in which they appear. 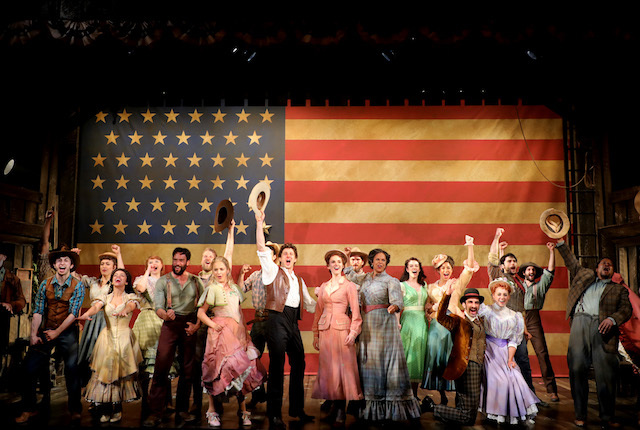 Everywhere in Goodspeed production of Oklahoma!, love and skill create the masterpiece anew.